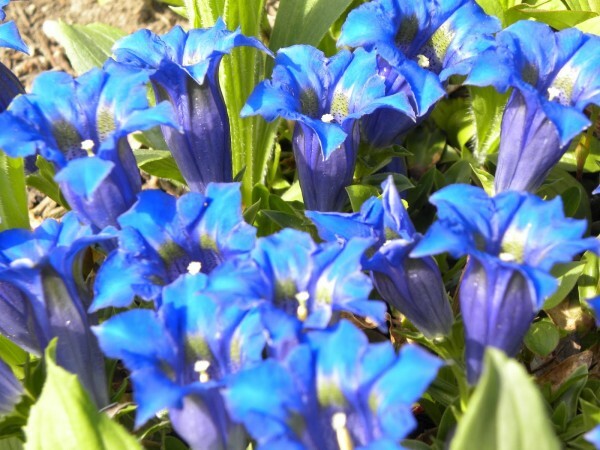 Gentiana cachemirica (Himalayan Gentian); often misidentified and hard to find, this electric blue gentian is also suitable for rock gardens, normally flowering in late summer. Tulipa ‘West Point’ (Lily-flowered tulip): this lily-flowered tulip has eye-catching yellow pointed petals. Tulipa ‘Ballerina’ (Tulip): this late spring flowering selection has point-tipped petals of red and yellow on the outside and red within. Narcissus ‘Thalia’ (Daffodil/Orchid Narcissus): this fragrant pure-white daffodil has multiple, pendulous flowers on each stem and is shown here with an assortment of tulips. Tulipa ‘Princess Irene’ (Tulip); this tulip is very weather and wind resistant and is one of the early spring season flowering tulips. Frittilaria imperialis ‘Lutea Maxima’ (Crown Imperial Lily): these bulbs produce up to six bell-shaped yellow flowers hanging below a topknot of leaves which are held on a single stem. Tulipa orphanidea ‘Whittallii Group’ (Tulip): this species tulip has burnt-orange flowers that are stained brown at the centre, usually flowering mid to late spring. Clematis ‘Guernsey Cream’ (Guernsey Cream Clematis): this vine boasts large creamy flowers from mid-May to July and again in late August. Trollius x cultorum ‘Orange Princess’ (Globe Flower): this pernnial prefers rich, moist, almost-boggy soil in full to partial sun. Flowering in late spring/early summer, this selection has large double golden-orange flowers. Sandra Pella has worked as Head Gardener of the Toronto Botanical Garden since 2008. She holds a degree in Political Science from the University of Western Ontario, and upon graduation worked in the financial sector until the pull of plants was too much to resist, whereupon she found herself at Janet Anderson Perennials (formerly JEA Perennials) as a horticultural technician. She has been the Perennial Manager at Summerhill Nursery & Floral followed by the Assistant Horticulturist at the TBG prior to its renovation. Sandra worked as a Gardener for two seasons with the City of Toronto as well as seasonal Gardener for the TBG prior to being named Head Gardener. She is self-taught in the field and thus greatly appreciated the experience a gardening internship in 2009 at Great Dixter in the UK brought to her. Sandra has a regular What’s In Bloom blog and is one of the spokespeople for the TBG.